MLK after his release from Birmingham Jail in 1963. Stay with me, please. I am not attempting to commit the civil rights equivalent of the unpardonable sin. I wish to make a point. My love for MLK is undeniable. I admired King on television as a child. I remember being sent home from kindergarten on Chicago’s westside the day he was assassinated. I watched the flames of looted buildings from our third floor apartment building windows as grief stricken (and some opportunistic) people torched Chicago’s busy streets. The world paused in mourning…and the hyperbole began. What the world often misses is that perhaps King, though rightfully so worthy of such a rich and celebrated legacy, wouldn’t want too much attention on just himself. We often miss the point of MLK’s mission, calling and legacy, if we raise a bar of Black leadership or civil rights leadership so high that no one else can attain. Perhaps US history, in wanting to correct its past mistakes of largely ignoring the contributions of Black in America, helped to create a Black leadership monolith. Yes, he was a preacher, pastor, and prophet. Yes, he was phenomenally charismatic in a way the world had rarely witnessed. Yet, his training as a pastor, and academician … his vows as an Alpha Phi Alpha Fraternity Brother (I couldn’t resist the plug) … his resolve as an activist, author, and Nobel Peace Prize winner…and his purpose as a husband, father and son…all taught him to invest in others. I fear that the manner in which we have remembered King has also entombed his humanity and leadership in a manner that he is civically messiah-ized, and socially mummified. We do so when we ignore the hundreds of thousands of everyday people who embodied his teachings, embraced his preaching, and lived his example of martyrdom for the good of Black and marginalized people, and the betterment of society. King is physically gone, but his adherents and beneficiaries live on! We don’t need a plethora of mini-MLKs! We don’t need white allies asking us who the Black leader (yes, singular!) in our community is. We don’t need society trying to convince us that we are where we are as a nation because King fell too soon. Black leaders need to stop jockeying for position with those white funders who may have fetishized the memory of King — and collaborate more regularly. This is what King would have wanted. We haven’t stopped believing in incandescent lighting simply because Edison died. We haven’t resorted back to horse and buggies because Ford died. We still fly even though the Wright brothers have been dead for ages. Yet we somehow are tempted to act as though the civil rights agenda can no longer be obtained by current leadership and activists. King was one brilliant man, yet he inspired 5000 children in Birmingham to become civilly disobedient and to march in the streets. Many were arrested…and parents allowed. He inspired and involved women and children, in amazing ways. 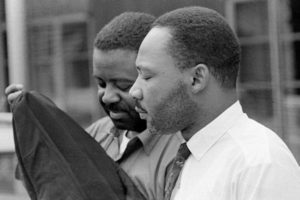 King was one brilliant communicator, however was not the first, nor only Black pastor to preach equality from a Black Baptist, or Methodist or Pentecostal or AME or CME pulpit. King was an amazing leader, but he didn’t handle the logistics of the March on Washington, or the planning of the Edmund Pettus Bridge demonstration in Selma, or the Sanitation Workers Strike in Memphis. His team did the planning, but the adherents of equality showed up and demonstrated. King is still my hero. He did not let the world’s citizens down with his untimely death. He did not leave the world hopeless. To believe so is to denigrate and minimize King’s life and mission. King would not want to be enshrined on posters and in speeches and within ecumenical services without his same commitment to unity and equality and love that he held. If we “celebrate” today and remain silent during continued injustice, we have become a part of the King Hyperbole. If we “celebrate” today and remain segregated in our relationships, we have become a part of the King Hyperbole. If we “celebrate” today and remain unchanged in our hiring practices of people of color, we have become a part of the King Hyperbole. If you “celebrate” today and still don’t believe or have taken the time to understand that #BlackLivesMatter, you have become a part of the King Hyperbole. If you “celebrate” today and still don’t “see color,” you have become a part of the King Hyperbole. If we “celebrate” today and have never used our pulpits to use a biblical text to stand against injustice and racism and disparity, you have become a part of the King Hyperbole. If you “celebrate” today and refuse adequate funding to struggling Black communities and their leaders because in your minds they are not King-esque enough for you, you have then become a part of the King Hyperbole. If White influencers pit Black leaders against each other, they have become a part of the King Hyperbole. And if we allow Blacks to pit Black leaders against one another, we have become a part of the King Hyperbole…and much worse. Today cannot merely be about regurgitating MLK, or further entombing MLK’s legacy by merely decrying injustice for one day with lip service and a day off of work. Today must be about deep introspection, amazing resolve, unrelenting bravery, and a sense that justice makes life better for everyone. King was more than a Black leader, although that would have been extremely sufficient. King was an American leader who challenged America to regain its soul, learn from its ugly past and to become a true land of liberty for all. King attempted to call out America to be its best and highest self. And if the truth were to be told, King tried to free the oppressor because he was oppressed as well…perhaps even the most of all. And in denying the most basic of inalienable rights to everyone, our country perpetuated its own slavery to its own greed for power and significance. MLK Day should be a day of rethinking King’s strategies for personal, societal and corporate transformation. It should also be a day of remembering Kings allies and fellow civil rights leaders who followed his lead and organized his rallies. MLK Day should be the day when we ratify the efforts of this great Black and American leader by recommitting ourselves to the principles of fairness and equality for which he died and became famous. In his day, King was referred to as infamous. Decades later, we reflect on his as famous…and safe. He was neither. This, too, is part of the hyperbole. If we are not wiling to shake up the status quo, we are not worthy of the MLK Day pins we sport on days like today. We cannot entomb King’s memory and message within the safe halls of State Office Buildings where people who look like King are legislated into poorer lifestyles, longer prison sentences and second-class citizenship. I personally recommit myself today—along with the organizations I lead—to the relentless and often thankless struggle of speaking truth to power. I recommit myself to allying with and within my community, partnership with non-black allies who understand the cost and the mission, and reminding the world that have not yet overcome. But we will, if we move beyond hyperbole…and move into personal and collaborative action. Rather than raising King—one man—back to life for the day, why not have each person who celebrates this day raise themselves to defending the standards of equality for all Americans, the way Rev. Dr. King did? Dear Rev. Dr. King, it is not fair of the world to expect more from you in death than we do of ourselves today! So, rest in peace, brave and historic trailblazer. We’ve got it from here. We know what to do. Thanks for the light, the lift, leadership, and example of love. Your contributions to the world are way too big and significant to ever hyperbolize. The hyperbole is, at times, our willingness to embrace your legacy and what it costs our own comfort and status. An infatuation with history simply leads to a repeat of that same history. We need to be a student of true history and pick up where you and your cohorts left off.